We have updated the BIRT Functions and BIRT Controls libraries today to support versions 2.3.2 and 2.5.1. Turns out that there were some minor changes that needed to be addressed. In addition, we did a bit of work to make the naming and version numbering more consistent. The biggest question I faced was how to do the version numbering for these plugins. As they stand, they are sub components to BIRT, which as a very specific version scheme. We thought about using version numbers that did not track BIRT versions at all. But then I started writing the documentation. Started to feel more like "you put your left foot in, ...". I think that there is a lot of value in making developers write the documentation. When you write your own docs, you quickly figure out when things that you have come to accept are really more difficult then they should be. Rather than write a bunch of hokey pokey build instructions, we decided to generate the components one more time using version numbers that will be easy for the component consumers. So it may not follow the Eclipse version number guidelines, but it is easy for our clients. And easy for our clients is my number one goal. BIRT Controls and BIRT Functions version guidelines. If you are using BIRT 2.3.2, then use version 2.3.2.X of our components. If you are using BIRT 2.5.1, then use version 2.5.1.X of our components. Also along the easy = good theme. I wanted to share how much I enjoy working with Google Code. I know that the Eclipse foundation is talking about doing some form of easy to use Eclipse Foundry type site, but in the absence of details on what is going on there, I went with Google. It has been very easy to create a project, with all the trappings a small project needs. Makes me wonder if the foundation really needs to create our own infrastructure to manage a foundry. Perhaps there is a way to leverage an existing code foundry and focus on creating a great migration path from the foundry to the Eclipse infrastructure. BIRT supplies scripting hooks for just about every report element in the palette. You can generally implement an onPrepare, onCreate, and onRender event handler for each of these report items. The onPrepare event fires before data is retrieved and allows you to change the design for a specific report item. The onCreate event fires when the report item is being created by the report engine’s generation task. The onRender event fires when the report item is being rendered by the report engine’s render task. These events and example are described on the BIRT website. Some report items offer more event hooks. For example a chart item actually has over thirty event hooks that allow total customization of the chart generation and presentation phases. As a side note, all chart scripts fire during the report engine’s render task. This does not mean the database is hit at render time though. The report engine will cache the data for a chart in memory or in a report document, depending on what task type is being used to run and render the report. The BIRT crosstab element offers onPrepare, onCreate and onRender hooks as well. These events are fired both for the crosstab as a whole and for each individual cell in the crosstab. When firing events for cells, these are processed top to bottom and left to right. Handlers can be written using the script tab at the bottom of the report design view. BIRT also supplies an event adapter to allow you to write these events in Java as well. This script removes filters from the first column level and sets some font information. Some of the more interesting capabilities are available when using the onCreateCell event hook. For example consider the following script. //Can reference cells by type or id - valid types "header" or "aggregation"
The onCreateCell script is passed the reportContext and an instance of the cell. The cellInst object has several methods that can be used to determine which cell is currently being processed. You can call getCellType() which will return header or aggregation. In the following image all cells in the red box will return aggregation and all others will return header. You can also call getCellID() which will return the specific element id that your crosstab uses for that cell. In this example the getCellID call will return 160 every time this cell is created. This can be useful when you are trying to determine if you have a new row or column in your crosstab. If this is the innermost header element then this cell will be created for every new row/column. The only drawback to this approach is that if the crosstab is in a library or you copy and paste it, the cell ids will change. refers to the PRODUCTLINE data binding. Also note that this is the value of the column as this particular cell is being processed. As it’s expression. This example references a particular dimension of the cube. You can reference cube measures as well. As with the column binding this will return the value for the specific cell you are currently processing. 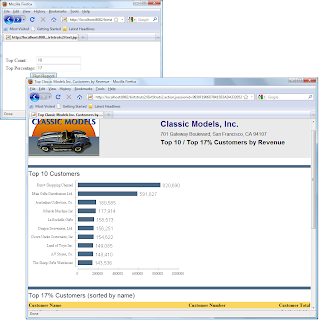 In the script posted at the top of this post, we use the cell instance object to set specific styling based on the values of various column bindings. This is done using the getStyle method. Using this method is no different than other BIRT report items. This value can then be referenced within the same crosstab or later in the report. For example the following expression for a text item can be used. 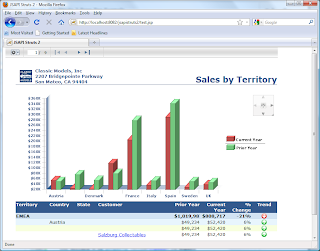 The example report output is presented below. The examples are available at Birt-Exchange. With today's information technologies, the amount of information we consume daily is enormous. Efficient management and fast access to frequently used information has become more important than ever. The fact that we use a wide range of applications and digital mediums makes the aggregation of information, search and retrieval even more difficult. Managing a huge amount of information successfully requires an intelligent tool that enables users to file, categorize and visualize such diverse types of data as information units in a single application. And now I am very intrigued, my company Innovent Solutions works in this very space. Naturally, I wondered about how BIRT could interact with Remus. Turns out that they have created an ODA for BIRT and have bundled some reports. Looks like another nice use of BIRT.